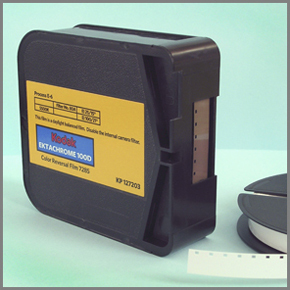 Colour reversal cine films are machine processed to the highest standards using Eastman Kodak formulated professional E-6 chemicals. Process quality control is constantly densitometrically maintained in-house using E-6 control films along with chemical monitoring and management. This service is for processing all modern E-6 compatible cine films such as…. Push ( ‘forced’ ) and pull processing ( +2 stops to -1 stop ) is also available. Super 8mm films are returned with leader attached and supplied on a 50ft plastic reel ready for projection. Standard 8mm ( 50 ft from 16mm 25 ft rolls ) are slit and spliced after processing with leader attached and supplied on a 50ft plastic reel ready for projection. 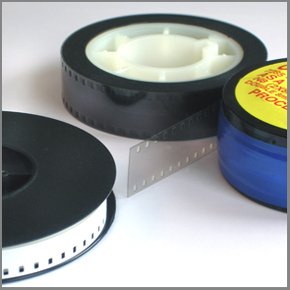 Specially slit and perforated formats such as 9.5mm films are returned rolled or on spools supplied ( no leader ). 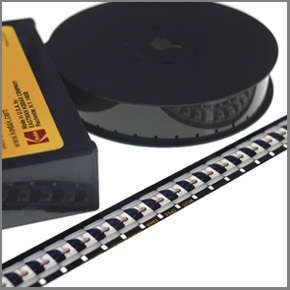 16mm films are returned on the supplied spool or core ( no leader ). Please note: Processing older colour reversal type films ( including VNF-1 ) or *colour negative ‘cross-processing’ ( ECN-2 processed though E-6 ) is NOT available. 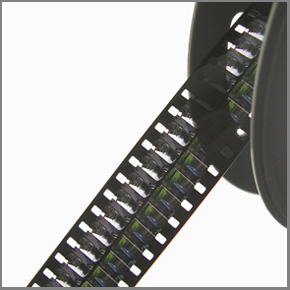 * These films have a rem-jet backing which can’t be removed during processing. Cine film scanning is not available here. Please see ‘More Information’ ‘Links’ page. Do you have Kodachrome ? If you have Kodachrome film for processing, you’ve missed the boat having them developed in colour now. The last service for process K-14 ended in December 2010 by Dwaynes Photo lab. The only practical option left is having Kodachrome films processed as B&W negatives ( then getting them scanned and inverted to positive for viewing ). Specialist laboratories such as Film Rescue International in Canada can help.